Commercial drones will soon be populating U.S. airspace, and venture capitalists like Tim Draper are placing their bets. Draper, an early investor in Hotmail, Skype and Baidu Inc., is now backing DroneDeploy, a startup that’s building software to direct unmanned aircraft on land mapping and the surveillance of agricultural fields. Draper even expects drones to one day bring him dinner. Venture investors in the U.S. poured $40.9 million into drone-related startups in the first nine months of this year, more than double the amount for all of 2012, according to data provided to Bloomberg News by PricewaterhouseCoopers and the National Venture Capital Association. Drones are moving from the military, where they’ve been used to spy on and kill suspected terrorists, to a range of civilian activities. Congress has directed the Federal Aviation Administration to develop a plan to integrate drones into U.S. airspace by 2015 and to move faster on standards for drones weighing less than 55 pounds. It’s not just startups that are anticipating the changes. ConocoPhillips says that drones could be used to monitor ice floes and marine mammals in the Arctic. Entrants could also include established drone makers AeroVironment Inc. (AVAV), Boeing Co. (BA)’s Insitu unit and Israel Aerospace Industries Ltd. in Tel Aviv, according to Bloomberg Government. Sales of civilian unmanned aerial vehicles, or UAVs, will reach $8.2 billion within the decade, up from nothing today, according to Phil Finnegan, director of corporate analysis at researcher Teal Group, which tracks aerospace and defense. “There’s going to be a lot of growth in this market,” Finnegan said. While the capital invested in drone-related startups has surged, it’s still concentrated in just a few companies. Three startups account for all of the money raised in the first nine months of this year, compared with five in all of 2012. Draper backed DroneDeploy through his Menlo Park, California-based firm, Draper Fisher Jurvetson. Airware, a startup in Newport Beach, California, raised $13.3 million earlier this year from investors including Andreessen Horowitz, Google Ventures and First Round Capital to develop customizable autopilots for UAVs that cost about $4,500 to $7,500, according to the company’s website. Airware found it much easier to attract the attention of venture capitalists this year after testing the product with customers, said Chief Executive Officer Jonathan Downey. “We’d looked at raising money last year, and it was very different,” said Downey, who plans to move the company to San Francisco in January. The business of drones still carries plenty of risks. UAVs will have to occupy parts of the airspace not used by airplanes, and investors don’t yet know what the rules will be. Concerns over privacy are most notable given the history of drones as tools used by the government and military. The American Civil Liberties Union has warned of the possibility of a “surveillance society” spurred by drones. “The only way to avoid this dystopian future and prevent mass, suspicionless searches of the general population is to ensure that information collected by drones for one purpose cannot be used for another purpose,” Allie Bohm, a strategist for the ACLU, wrote in an August blog post. Andy Wheeler, a partner at Google Ventures, said drones are moving into the mainstream because of the steep drop in the cost of sensors, which have been mass produced for smartphones. The plunge in costs helped convince Google Ventures to invest in Airware as well as another drone-related startup, Wheeler said, declining to say which one. “We are talking orders of magnitude lower than military technology,” Wheeler said, referring to the prices for commercial equipment. While DroneDeploy is building software and Airware is developing systems, some startups are focusing on services. Matternet Inc., funded by Andreessen Horowitz, aims to use drones for delivery of items such as mail and medical supplies. Bloomberg LP, the parent of Bloomberg News, is an investor in Andreessen Horowitz. Firefighters and law enforcement officials are likely to be some of the early beneficiaries of the drop in costs, said Kent Goldman, a partner at First Round Capital in San Francisco. “I see a bright future for non-military applications,” he said. 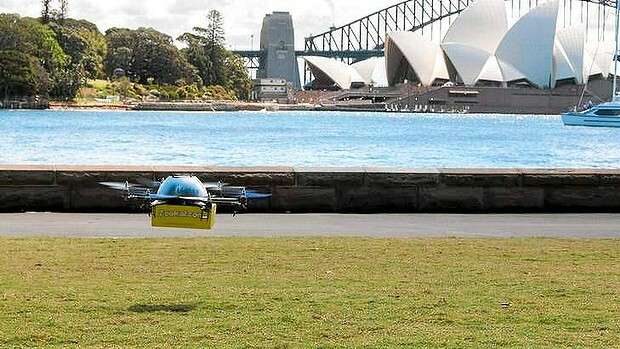 Australia may soon be the first country in the world to see commercial courier deliveries by drone, if a launch by a textbook rental service and an Australian tech start-up goes according to plan. 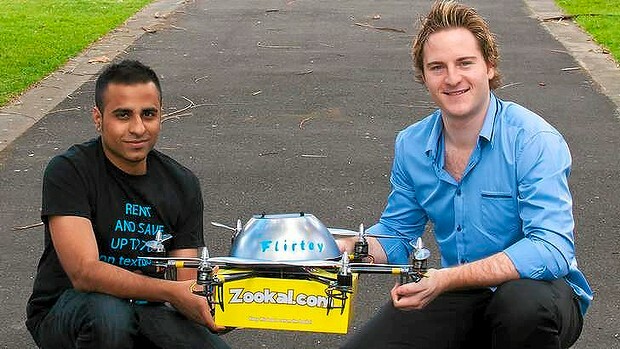 From March next year and pending regulatory approval, students will be able to order books from Zookal via an Android smartphone app and have one of six Flirtey drones deliver them to their door in Sydney. As the drone arrives, students will be able to track it in real-time on a Google map. After its initial launch, Flirtey hopes to then expand the service to other products and locations, even seeing potential to deliver food and drinks to people and blood to and from blood banks and hospitals in future. 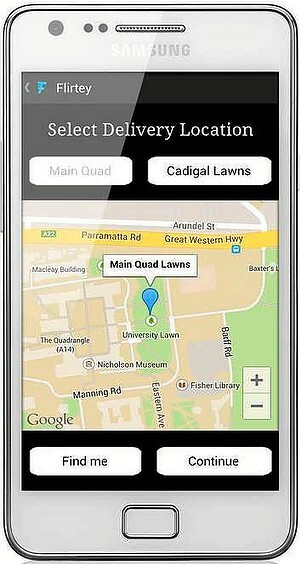 Textbook rental service Zookal partnered with Flirtey, a start-up born at the University of Sydney, to cut costs on deliveries. 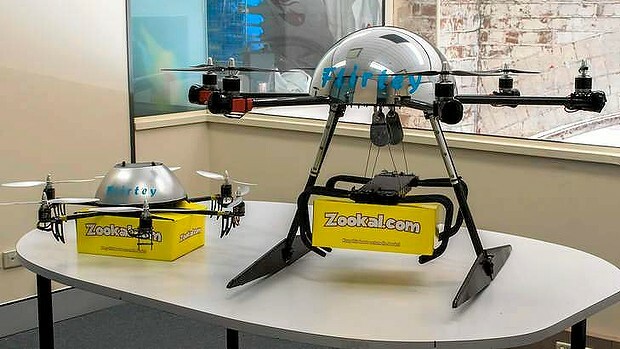 If Flirtey gets the approval of Australia’s Civil Aviation Safety Authority (CASA) it will be the first use of fully automated commercial drones for deliveries in the world, the company claims. Zookal’s founder Ahmed Haider is confident. Australian regulators entered the Drone Age in 2002, when Australia became the first country to introduce legislation covering unmanned aerial vehicles, leading the world in creating rules governing civilian use of the technology. But whether the company can get CASA’s approval remains to be seen. CASA confirmed it had been corresponding with Zookal but an application had not yet been lodged. Melbourne’s Metropolitan Fire Brigade already uses drones to survey emergency situations and is one of the 56 operators in Australia who have a licence to operate one. In one recent example, it used a “CyberQuads” drone to survey a truck hanging precariously from a freeway in Melbourne’s north in March. Animal rights activists have also used them to spy on farmers, while Channel Nine’s 60 Minutes used one when it flew over Christmas Island’s immigration detention centre. The craft later crashed into the sea. Another crash occurred earlier this month when a drone collided with the Sydney Harbour Bridge. A number of companies have attempted to get the drone delivery idea off the ground. Domino’s Pizza sent its “DomiCopter” on a test flight in June in Britain. Tacocopter.com also proposed to deliver tacos in San Francisco’s Bay Area using drones, but commercial drones aren’t yet a possibility in the US and Britain. The US Federal Aviation Authority acting administrator, Michael Huerta, recently said the agency was poised to realign itself to prepare for the coming explosion of drones. It will begin granting personal and commercial licences in 2015 and estimates that there could be as many as 30,000 drones flying around the US by 2020. Unlike many amateur drones, such as the AR.Drone, which are steered with a remote control, Flirtey will be autonomous and use “collision avoidance” technology to avoid birds and buildings. It will fly high enough to avoid pedestrians and below 122 metres. 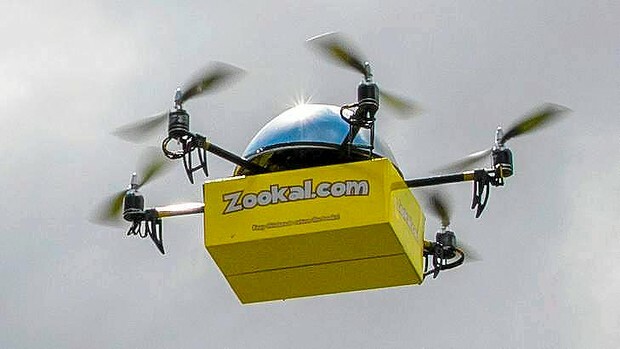 The delivery mechanism allows for textbooks to be safely lowered to the customer without the drone having to leave its hovering height of about three metres. If gentle force is applied to the drone’s lowering cord, the parcel is released. It has built in redundancy, including a back-up battery, and can also continue to operate if one rotor blade fails. 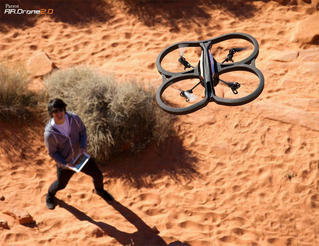 The drones — which can carry up to 2 kilograms — will significantly reduce the cost of delivering textbooks. Same day postal delivery in Australia can cost up to $29.95, a cost Zookal absorbs, but Flirtey will cost just $2.99. The drones will also reduce waiting times to as little as two to three minutes, the company claims. In the future, Flirtey plans to deliver food and drinks; sees potential in using drones at beaches to deliver life vests to those in distress, and in hospitals, where blood could be transported to and from blood banks. Haider said the idea of delivering textbooks via drones came about after trying to find ways to reduce delivery cost, one of the company’s biggest expenses. Flirtey founder Matt Sweeny said he came up with the idea of using drones while in China where his McDonald’s orders were delivered via bicycle “in moments”. Should CASA not approve delivery directly to homes, Sweeny said designated “drop off” areas, in places such as parks, might become Plan B.
Unmanned aircraft systems (UAS), colloquially known as “drones,” are fascinating as pieces of technology. But they are not revolutionary. There is little a UAS can do that an airplane or a helicopter can’t. 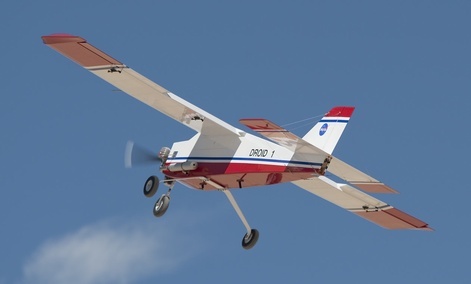 Yet because of their size, remotely-piloted nature and extensive utilization by the military, UASs have captured the public’s attention in a manner that is generally reserved for truly disruptive, world-changing technologies. This is not good news for the UAS. Unmanned aircraft are widely valued for their ability to track and kill enemy targets overseas. A recent NBC News/Wall Street Journal poll found that 66 percent of Americans support UAS strikes abroad. But their use has spawned a cottage industry at home trafficking in drone-based paranoia, recently peaking in April with an eight-city drone protest campaign. Fear and misunderstanding of unmanned aircraft is spreading rapidly, and it is not just at the fringes of society. We have identified 30 states in which legislatures have passed or are considering bills this year to restrict the ability of public and private organizations to operate unmanned aircraft. Proposed prohibitions range from banning UAS surveillance, banning most aerial photography and requiring public hearings before a law enforcement agency could purchase UAS. Not all of the proposed legislation is necessarily ill-advised in its content—there must be clear privacy and operational regulations–but the cumulative rush to legislate based on fear is not derived from a rational assessment of the societal costs and benefits of UAS operations. Why are unmanned aircraft now being viewed as a threat-worthy of SkyNet? Last week’s revelation by FBI Director Robert Mueller to the Senate Judiciary Committee that his agency uses UAS for domestic surveillance on a limited basis will certainly not help. But we believe the true problem, which has been allowed to develop unchecked for too long, is that there is a disconnect between the public and those who build and use unmanned aircraft—and who know their actual capabilities and limitations. Illustration of the United States Navy’s BAMS unmanned aircraft. Because of this failure to communicate, even as unmanned aircraft rack up innumerable successes for the military and law enforcement, those very successes are slowly poisoning the well of public trust and creating a “not in my backyard” mentality about their use. This is some Firefly-level futuristic Old West juxtaposition. Sometimes it’s hard to get the big picture from the ground. In a vineyard, the color of vines and signs of stress are easier to see, especially for a whole field, from the sky. Today, this kind of aerial surveying for agriculture can be done with an appointment and service fee from a manned airplane or helicopter, but in the future it could all be done by drones the farmers’ themselves own. DRNK Wines, a vineyard located in Sebastolpol, California, recently had 3D Robotics, the drone company founded by former Wired editor-in-chief Chris Anderson, fly a drone over its fields. 3D Robotics specializes in piloting systems for smaller drones, and the vineyard used 3D Robotics’s route-plotting software for mapping out the drone’s precise path. In just an hour, the drone flew over the field snapping pictures, then stiched together the pictures to create a comprehensive map of the vienyard. Looking over the newly created field map, farmer Ryan Kunde noticed two things he expected, and one he didn’t. The top of the hill had darker vines, indictating more water and better soil, than the lower slopes. That variation was expected. Unexpected was a fertile crescent at the bottom of the hill, with darker vines indictating a second especially good growing patch. With that knowledge, Kunde sampled grapes from the crescent, and decided which part of his crop to harvest first. Privacy concerns, integration into the national airspace and spectrum allocation are the big three obstacles to wider deployment of unmanned aerial vehicle technologies. Like any new technology that develops faster than the speed of policy, lawmakers, lawyers and others grappling with these issues should not allow them to curtail the benefits of UAVs. Who would have thought in the 1950s that room-size computers would spawn new areas of law and new questions around intellectual property and warfare? Finding creative ways to manage equally innovative UAV technologies involves similar hurdles. Innovative technologists and business leaders had the vision to harness the benefits of computers, while taking on the contemporary issues they raised. We are in the middle of doing the same with UAVs. Unmanned but not unpiloted, UAVs are commonly referred to as “drones,” which implies the absence of an intelligent human operator. In fact, satellite and ground control stations feed a large amount of data to remote UAV pilots to inform their decisions. As is widely reported, the U.S. military uses UAVs in theater now and has been successfully using them for decades. The public knows less about civilian uses of UAV technology. The Aerospace Industries Association released a report recently to address the perceptions and potential of UAVs. They noted that domestic applications are predicted to include search and rescue, law enforcement, weather forecasting, border patrol, firefighting, disaster response, precision farming, commercial fisheries, scientific research, aerial photography, mail delivery, communications relay, infrastructure monitoring and emergency management. The corresponding benefits are more accurate weather forecasts, safer streets, bumper crops, fewer Americans engaged in dangerous jobs, more dangerous fugitives apprehended and reduced risk to firefighters. Benefits to society result not just from UAV platform technology, but the sensors they carry – sensors that can be applied to saving lives after a natural disaster; providing situational awareness during wildfires; capturing real time information about the impact of oil spills; and protecting the security of our border by identifying the trafficking of weapons or drugs. These are but a few of the applications drones have to positively affect society on a global level. Two recent nationwide surveys indicate widespread public support of UAVs. A Duke University survey found 57 percent of the public supports their use for any application and an even higher percentage support specific applications, including search and rescue operations (88 percent). Also, 74 percent of those polled by the Christian Science Monitor said they support nonmilitary domestic use of UAVs provided individual privacy concerns and ground safety issues are met. In June during a Senate Judiciary Committee hearing, FBI Director Robert Mueller admitted the FBI has used unmanned aerial systems for U.S. domestic surveillance. In a follow-up letter responding to a query from Sen. Rand Paul, the FBI said the agency uses UAVs in limited circumstances when there is a specific operational need. The letter goes on to outline several rules and regulations the FBI follows when using UAVs, including obtaining Federal Aviation Administration approval. Each UAV surveillance request also undergoes the scrutiny of FBI legal counsel to ensure there are no Fourth Amendment or privacy concerns prior to senior FBI leaders approving. In cases where there is an expectation of privacy, the agency must also obtain a search warrant. So far, according to the letter, none have been needed. Most of the letter’s content defensively centers around the process the FBI follows when using drones. It also spends three sentences on the reasons why it has used them: for surveillance to support missions related to kidnappings, search and rescue operations, drug interdictions and fugitive investigations. This is where the UAV debate should center, on finding ways to exploit the potential of UAVs while safeguarding civil liberties. Just this past July, the FAA certified the first two U.S. UAVs for restricted use in commercial airspace, pending airworthiness certification. The FAA has been willing to work with industry, including my company, to develop the infrastructure and technology needed to ensure safe and efficient adaptation from military to commercial use in the national airspace system. And it is also willing to establish a vision that will serve the needs of all stakeholders, while ensuring the safety of our airspace. We must build on this progress. Under Congressional stewardship, a commission comprised of technologists, legal and FAA representatives and stakeholder beneficiaries should study and recommend how we leverage the benefits of UAVs while addressing the big three obstacles. UAV technology is ready and the needs exist. We are at the convergence of innovative UAV platforms of all sizes and capabilities, with sensor and computing technologies that will enable us to meet the needs of many markets. There is public support. What we need now is a path forward. Join us for UAV Day at the Reuben H. Fleet Science Center in San Diego, California on Sunday, October 6, 10 a.m. to 4 p.m., and meet local experts in this new and ever-diversifying field of technology. In conjunction with our exhibition, On the Fly: Technology Takes Off, the Fleet is celebrating San Diego’s innovative UAV and multi-rotor community by inviting local organizations to join us for UAV Day. They will display small multi-rotor aircraft, custom and commercial UAVs and autonomous RC planes and helicopters for hobbyists. Most will also bring videos with information about their creations, their organizations and UAV technology and its myriad applications. You may even take home your own quadcopter! All attendees can enter to win an AR.Drone2.0, the one-of-a kind quadcopter developed by French company Parrot featured in our exhibit. Parrot AR.Drone2.0 are very robust and stable, can be controlled by Wi-Fi using a smartphone or a tablet and are equipped with an embedded high-definition camera enabling video and photo recording and sharing. There will be brief lectures for interested visitors on the history and development of unmanned aircraft history and its civil integration, current FAA restrictions on commercial usages for UAVs and the positive applications being developed for UAVs and quadcopters. Join in a workshop on unmanned technology, take a pilot lesson on a quad simulator and see how they function in an interactive mini wind tunnel. In conjunction with the lectures, catch a new documentary making the rounds of film festival,s now titled Civilian Drones—Search and Rescue, based on a Texas man who has been doing recovery work with multi-rotors in the desert for the past ten years. The Air Law Institute is sponsoring a group of kids from an Old Town engineering scholarship program, who plan on building a scale model of NASA’s Ikhana unmanned aircraft. And don’t miss the clown and ghost quads, just in time for Halloween! Many of the multi-rotors and related products will be available for sale as well. Participants thus far include AUVSI San Diego, Air Law institute, Innovative Designs, Dr. Eric Frost, 3D Robotics, San Diego Wind Tunnel, Isis Copter, Go Professional Cases, MultiRotor Systems and San Diego Drone User Group. All activities are free with Fleet gallery admission.